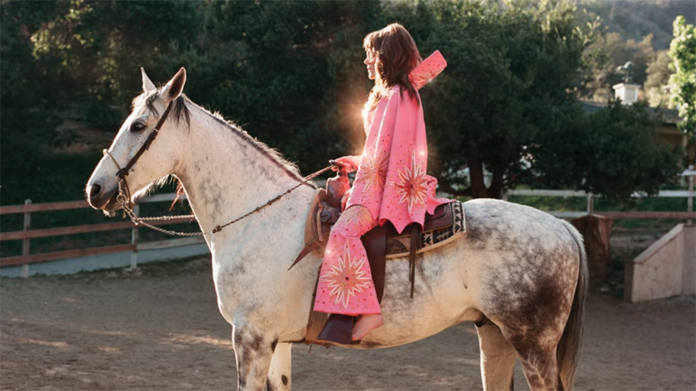 Jenny Lewis is releasing a new album, On the Line, on March 22 via Warner Bros. Previously she shared its first single, "Red Bull & Hennessy," which was one of our Songs of the Week. Now she has shared another song from the album, "Heads Gonna Roll," which was posted to YouTube via a largely static image of her on a horse in a sparkly Elvis-in-Vegas type outfit. Lyrically, you have to wonder if the song is about anyone in particular or is totally made up, as she sings about riding in a private jet with someone she's seemingly not on great terms with these days, although she ends the song with: "Maybe a little bit of hooking up is good for the soul?" The song features Ringo Starr on drums and Don Was on bass. Listen to it below, followed by her upcoming tour dates (including some newly announced dates).